February | 2010 | Promotional Incentives, Inc.
For anyone who has been in the restaurant business, you know how hard the work can be, especially if you are a manager. Each year, Rib City Grill gives managers a gift to convey appreciation for their efforts throughout the year. 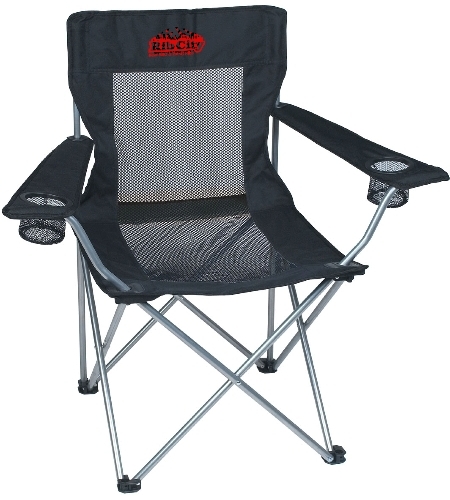 The gift for Christmas 2009 was a Deluxe Pop-up Chair imprinted with the Rib City logo. Each year Promotional Incentives assists Marketing Manager Beth Watson with product ideas that will be useful at work and/or in their personal life, have a high perceived value, and accommodate the budget. The selections are narrowed down by management and the best gift is chosen. Previous winners include an embroidered all-weather jacket, logoed watch and messenger bag. With a low minimum of 25 pieces, matching carrying case, these chairs are effective incentives, gift with purchase, recognition and/or donor gift. Available in several patterns and colors, at a reasonable price (under $15) this is a promotion you can sit on! Put your money where your mouth is…it may be cliché but it applies to the Lee County Horizon Council’s response to the economic challenges facing the county. At the annual meeting on 1/29, the brand new www.Together4Business.com campaign was unveiled. More than just a series of ads, this branding effort incorporates an innovative approach to economic development, involving community business leaders and local residents in the effort. The initiative has combined numerous resources for marketing the concept widely throughout the county fueling the local economy at the same time. With millions of dollars in incentives to new businesses, as well as perks for those providing leads for business location and/or expansion, the campaign is directed at the citizens who will benefit most by this type of economic stimulus. In addition to a poster created by local artist Ikki Matsumoto, meeting attendees were given a T-shirt bearing a teaser phrase on the front (“I Have $25 million!”) and an applicable response on the back (“Want to help me spend it?”). For greater impact, the T-shirt was compressed in to the shape of a dollar bill, with an insert containing additional information on the financial incentives associated with the program. Promotional Incentives was the promotional company chosen to provide the T-shirts as a clever reminder of not just the annual meeting, but a constant reminder of the dollars and sense of this initiative. Chisano Marketing, the “agency of choice” for creating the brand identity and campaign, designed the T-shirt graphics to coordinate with other advertising, but also add a different twist with emphasis on the financial incentives. Promotional Incentives completed the promotion in an accurate and expeditious manner. Steve Pontius, president of Waterman Broadcasting and chairman of the Business Climate Task Force, summarized the effectiveness of the T-shirt promotion with this spontaneous comment: “That is One Fabulous Promotion!” Thanks Steve – we couldn’t have said it better ourselves! For more information on the campaign and how you can help go to: www.FortMyersRegionalPartnership.com.